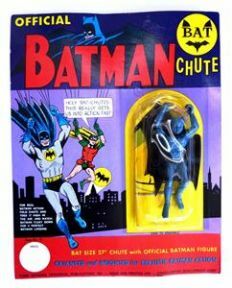 This cool Batman toy was manufactured in 1966 by Consolidated Development Corp. The figure is non-poseable and the chute measures approx 27 inches. The packaging features beautiful graphics, the plastic bubble is firmly attached, but is slightly dented in on the top, the backing card is in very good condition with only slight wear.